The Trans-Pacific Partnership (TPP) has been signed by all countries involved in the agreement. The agreement was marked by protests from citizens all around the world. Now, all that remains is ratification. Signed and sealed but not yet delivered, the Trans-Pacific Partnership will now be put through the wringer in member countries for ratification. Malaysia was so enthusiastic the deal passed a vote in Parliament last week, even though it didn’t need its approval. And in the Socialist Republic of Vietnam it will just require the consent of the state president. Protesters in Auckland were estimated at more than 5000 at their height and a rump gathered outside SkyCity for several hours after the signing. The moment where all 12 countries were to sign off on the agreement was predicted as far back as January 12, even if some countries at the time officially told the public no decision was made on the matter. So, what’s next? The final step of TPP implementation is ratification. It’s the only step remaining before the agreement becomes law. It’s likely that citizens are only going to ramp up pressure to try and have the deal rejected in their respective countries. Unfortunately, stopping the TPP dead in its tracks may be an uphill battle from now on. Provisions in the agreement legally oblige the signatory countries to ratify the provisions in the agreement within a certain time frame. Which provisions and which countries this affects varies, but deadlines do exist within the TPP to force countries to carry through on their promises all based on their signatures. Still, killing the deal isn’t entirely impossible either. From a technological perspective, the trade deal would bring in a host of restrictive copyright laws. As we earlier examined, the trade deal would force countries to ratify many other copyright treaties including various WIPO (World Intellectual Property Organization) treaties, kill Internet privacy for domain name registrants, create a so-called “TPP Commission”, extend the length of copyright, add criminal liability to the circumvention of a DRM, effectively institute statutory damages for non-commercial infringement, mandate government spying on the Internet for the purpose of tracking copyright infringement, possibly add unlimited damages for copyright infringement, allow “destruction” orders of any product circumvents copy protection, allows authority to enforce copyright laws even when infringement hasn’t taken place (ala “imminent” infringement), seize personal devices at the border for the purpose of enforcing copyright law (and destroys your property and forces you to pay if a border guard believes you have copyright infringing content on your personal devices), institute traffic shaping and site blocking for the purpose of allegedly enforcing copyright, implement a notice-and-takedown regime, force ISPs to install backdoors for others to enforce copyright law, and force ISPs to hand over customer’s personal information without court oversight or compensation to the ISP. So, in short, the TPP is a major crackdown on civil rights on the Internet. Regardless, the fight to stop the TPP before the signature hits the paper is over and civilians lost. The fight isn’t over, but civilians are being forced to take their final stand now. 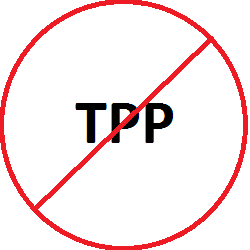 I am a software and web developer and I want to do everything I can to increase awareness and acknowledgement of how bad TPP is for freedom. I hope to not only join but greatly contribute with you and others in the fight these next several years. We’ve been hoodwinked into thinking this was debatable. I feel sick at the thought of this passing. Where Are the Canadian TPP Consultations?